Ocean Yachts 48' 48 Motoryacht 1990 Yacht For Sale | Cruise or Liveaboard! 48' Ocean Yachts 1990 Cruise or Liveaboard! (LOCATION: Cape Coral FL) This 48' Ocean Yachts Aft Cabin Motor Yacht has a flybridge, spacious salon, and three staterooms. There's room for everyone. She's a great day boat, sunset cruise boat, and would also be enjoyable for extended cruises or as a liveaboard. Starting at the top we have a spacious flybridge with radar arch, bimini top, and eisenglas enclosure. The helm is forward with captain’s chairs. There's guest seating to either side with plenty of room for entertaining in the sun and sea air. The large aft deck is equipped with an electric dinghy davit. A wide staircase takes us below to the salon. The pilothouse is forward with lower helm station starboard and a full galley port side with refrigerator/freezer, electric range with oven, dishwasher, trash compactor, and microwave oven. The carpeted salon is open, bright, and inviting. Dining area with round table and four chairs is forward with entertainment center port side. To starboard we have a bar with ice maker and L-shaped convertible settee with drop-leaf table. Relax, entertain, or dine in comfort. There are three staterooms. The forward guest stateroom has queen berth, bulkhead cabinets, two cedar-lined hanging lockers, and an ensuite head with private door The forward head doubles as the day head with a second door and has mirrored vanity and separate shower stall. There is an amidships guest stateroom with double berth, two hanging lockers,ensuite head and stall shower, and laundry with washer and dryer. The master aft stateroom is accessed from the salon and has queen berth, two night stands with credenzas, large hanging lockers, and ensuite head with vanity and shower. This 48 ACMY is powered by twin Detroit Diesel engines, and equipped with a Westerbeke generator and three reverse cycle HVAC units. She has the accommodations to serve as a weekend getaway, a live-aboard, or an extended cruiser. 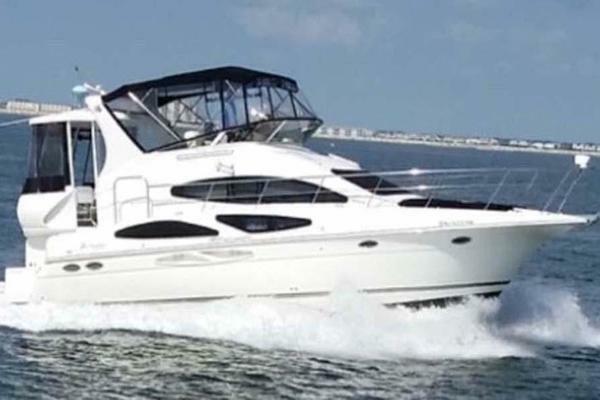 Call now for more information and to schedule a showing of this Ocean 48 Motor Yacht.